＊In scientific terms, umami is defined as the taste of salts combining glutamate, inosinate or guanylate with the likes of sodium ions, such as monosodium glutamate, or potassium ions, but for the purposes of this pamphlet, except for sections requiring scientific precision, we describe umami as the taste of glutamate, inosinate and guanylate. 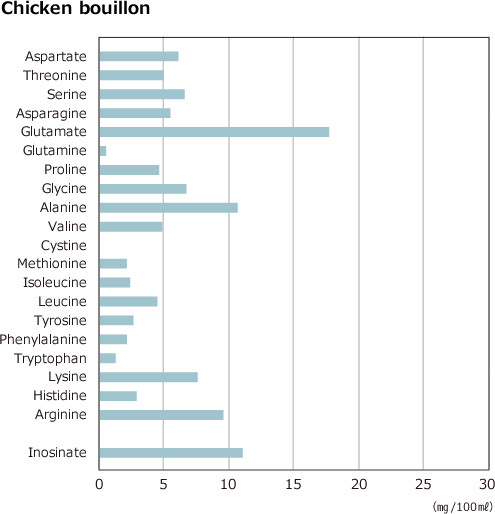 Salts of the amino acid aspartate and the nucleotide adenylate are also types of umami substance, weaker than glutamate. Succinic acid, which gives shellfish their distinctive taste, has also been identified as another possible umami substance. Since the word “umami” is originally Japanese and the Japanese expressions “to have umami” and “umai” can mean “tastiness” or “deliciousness,” “umami” is often confused with “deliciousness.” Whether something tastes good or not is a comprehensive yet subjective evaluation determined by elements such as taste, aroma, texture and temperature, besides other factors such as appearance, color and shape, as well as one’s physical condition, surrounding environment, cultural background, and previous experiences. 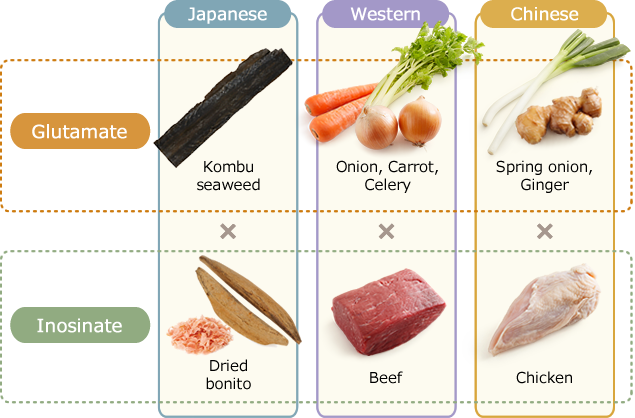 Of these various elements, umami in balance with the other basic tastes (sweet, sour, salty, and bitter) plays an important role in determining the deliciousness of a dish. By detecting the sour taste of organic acids in unripe fruit or rotting food, or the bitterness of alkaloids, for example, our tongue enables us to avoid danger. In contrast, when we detect the sweetness of sugars that serve as our energy source, or the saltiness of minerals necessary to maintain the balance of body fluids, we actively consume them. Umami meanwhile serves as a signal to the body that we have consumed protein. Sensing umami triggers the secretion of saliva and digestive juices, facilitating the smooth digestion of protein. The main components of umami are glutamate, inosinate and guanylate. Glutamate is found in a variety of foods including meat, fish and vegetables. 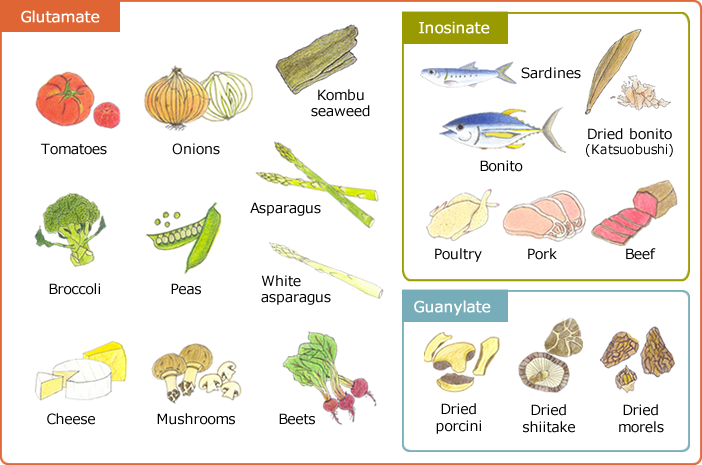 Inosinate is found in generous quantities in animal-based foods such as meat and fish, while large amounts of guanylate can be found in dried mushroom products such as dried shiitake. We also know that the umami component of food increases as a result of processing such as ripening and fermentation. Many traditional foodstuffs from around the world, such as soy sauce and other fermented condiments made from grain, fish sauces such as Thailand’s nam pla and nuoc mam from Vietnam, and cheeses are excellent sources of umami. Meat generally undergoes a certain period of aging prior to being sent to the market. The main component of meat is protein, which is made up of a long chain of 20 amino acids. 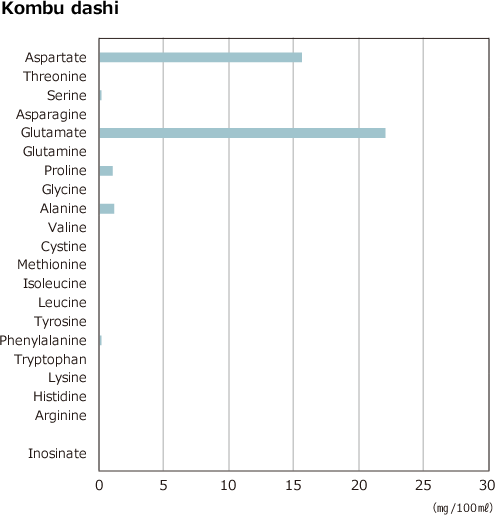 Glutamate constitutes the largest proportion of these amino acids, around 15 percent. Protein itself has no taste. 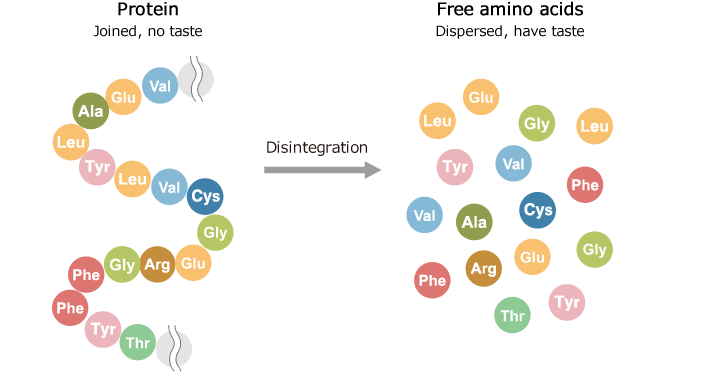 Taste is only perceived when protein breaks down and the amino acid chain disintegrates. These scattered amino acids are known as free amino acids, and are usually referred in this pamphlet as amino acids. 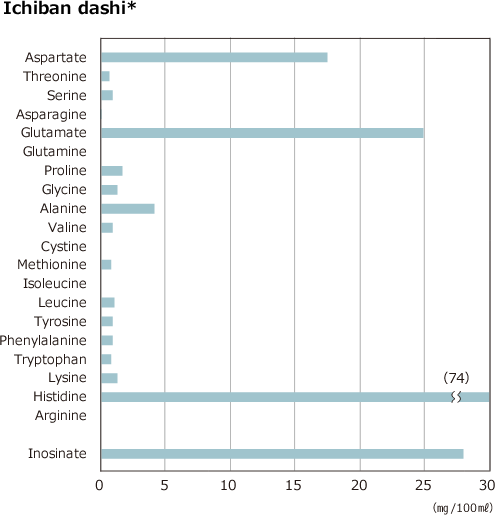 This is why instead of “free glutamate,” we simply use “glutamate.” As well as the likes of free glutamate and free aspartate containing umami, free amino acids can impart a sweet taste (from glycine or alanine) and bitterness (from leucine or valine). The flavor peculiar to meat emerges when the protein in the meat breaks down during the aging process, and the umami-carrying free glutamate increases. A similar phenomenon occurs in foods such as cheese, cured ham, miso and soy sauce. In the case of cured ham a leg of pork is salted, allowed to develop mold, dried and carefully aged. During this process the volume of glutamate is boosted by around a factor of fifty. In cheese, the longer the aging process, the higher the glutamate. Umami is an important taste for newborn babies. Breast milk is rich in the umami component glutamate. It is also contained in amniotic fluid, making umami a familiar taste even before birth. For babies too, the basic tastes are a vital signal that tells them whether what they have consumed is nutritious or harmful. When sour and bitter solutions were placed in the mouths of four-month-old infants transitioning to solid food, their facial responses indicated rejection of the tastes. On the other hand, when offered a sweet liquid, they appeared calm and happy. When then given vegetable soup, the infants screwed up their faces slightly, but when given vegetable soup with umami added, they exhibited the same degree of satisfaction as when given the sweet liquid. ＊This experiment was conducted under expert supervision and in accordance with the method of Dr. J. E. Steiner. Because infants are less sensitive to saltiness than adults, and out of concern for any possible health effects, no experiments were undertaken with salty tastes. Where do we sense umami? Dotted over the tongue are patches of tissue called papillae, which contain bud-shaped organs that detect taste.These taste buds, as they are commonly known, consist of dozens of taste cells clumped together. 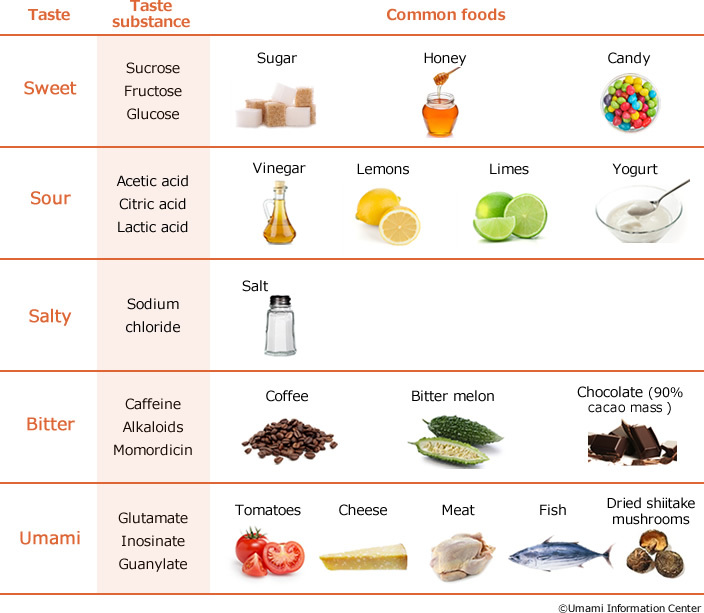 The taste cells in turn contain receptors for sweet, sour, salty, bitter and umami substances. From these receptors, information is transmitted to the brain,and we perceive the taste of the food. Umami substances function as the keys and their receptors as the keyholes. When the receptors in taste cells receive the umami substance glutamate, that information is swiftly passed on to the brain via taste nerves, and umami is recognized. Each of the basic tastes acts as a signal for nutrients or harmful substances. Umami is the taste of amino acids and nucleotides, and tells us when a food contains protein, a nutrient essential to survival. Recent studies have revealed the presence of umami receptors not only on the tongue, but also in the stomach. 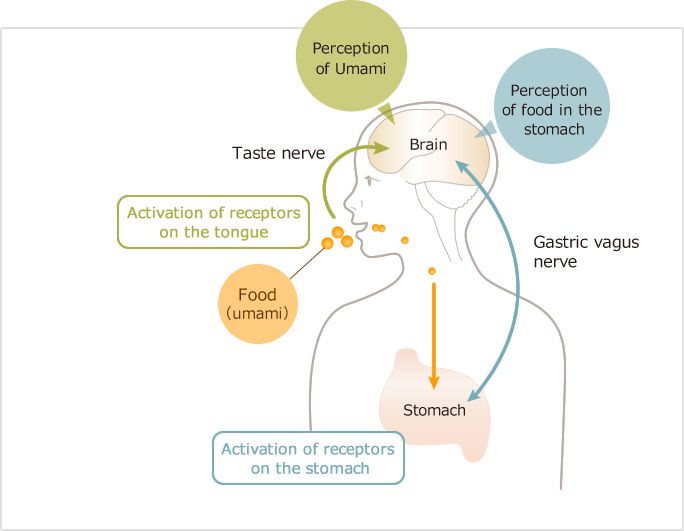 When food enters the stomach, and receptors in the stomach detect an umami substance (glutamate), the umami information is conveyed to the brain via the vagus nerve. The brain in turn transmits a message to the stomach that triggers the digestion and absorption of protein. Thus umami is closely involved in protein digestion and absorption, giving it a vital role in our bodies. No doubt the future will bring further discoveries about glutamate’s role in digestion and absorption. Throughout history, human beings have created various seasonings and condiments to improve the palatability of food. Salt has been a familiar flavor-enhancer for thousands of years. Foods such as sugar and vinegar have also been known since ancient times. This is why we can all readily imagine sweet, sour and salty tastes. Umami too is contained in a variety of foodstuffs, and is familiar to us from the taste of traditional foods such as soy sauce, miso and cheese. However, it is only around a century ago that umami was discovered as a basic taste, and monosodium glutamate invented and launched as an umami seasoning. There were long thought to be just four basic tastes: sweet, sour, salty and bitter. Then a scientist in Japan?Professor Kikunae Ikeda of Tokyo Imperial University (now the University of Tokyo)?noticed the presence of a taste that did not fit into any of these categories. 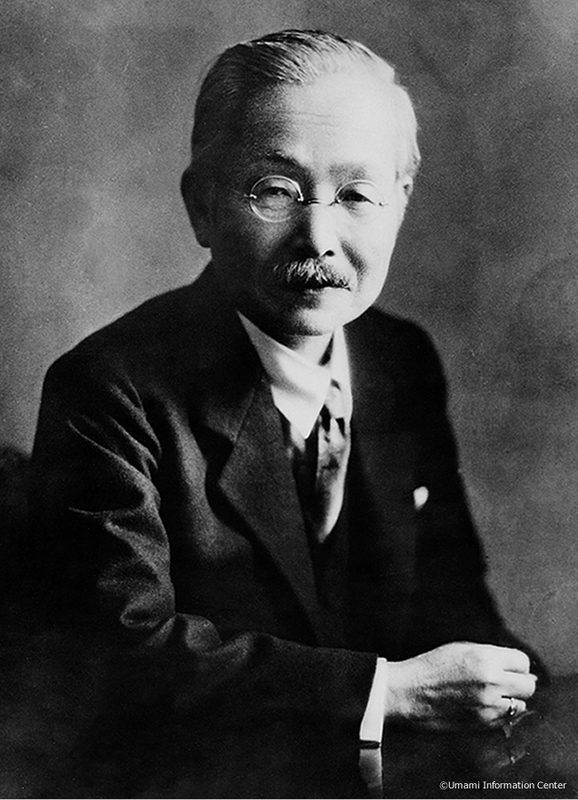 Professor Ikeda discovered the main taste component in kombu dashi (broth or stock) to be glutamate, and dubbing it “umami,” penned an academic paper explaining the existence of umami as one of the basic tastes. 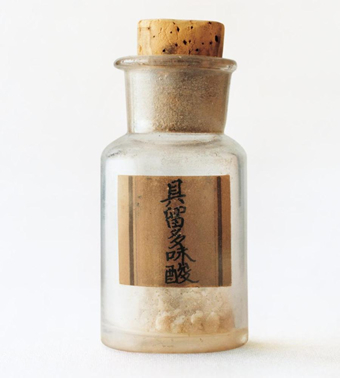 Following in Professor Ikeda’s footsteps, other Japanese scientists discovered the umami substances inosinate and guanylate. Shintaro Kodama, Professor Ikeda’s leading disciple, identifies the nucleotide inosinate as the umami component of katsuobushi (dried bonito flakes). Dr. Akira Kuninaka of the Yamasa Shoyu Research Laboratories identifies the nucleotide guanylate as an umami component, and later confirms it to be the umami component in dried shiitake mushrooms. Adelicate taste. A mild, subtle taste. A taste that spreads across the tongue, coating it completely. A persistent, lingering taste. A mouthwatering sensation. 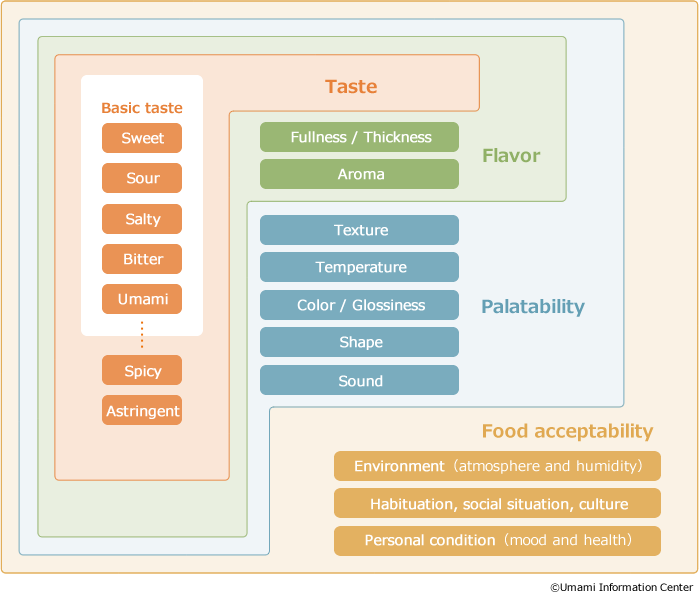 This is how chefs who have experienced and recognized umami describe its characteristics. 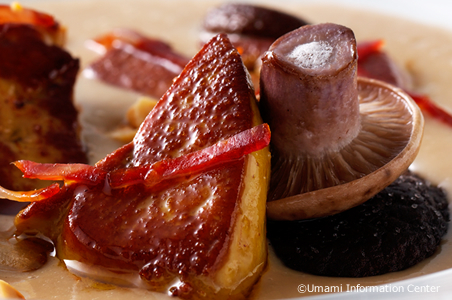 Let us take a look at three properties of umami. Umami is frequently described as a taste that “spreads across the tongue, coating it.” Experiments on the tongue’s areas of taste receptivity have shown that sweet and salty tastes are sensed more intensely on the tip of the tongue, while umami is sensed all across it. One study had participants separately take solutions of the umami substances glutamate and inosinate, table salt, and tartaric acid (the acid component of wine) into their mouths, then spit the solutions out and compare the intensity of taste left in their mouth. While the salty and sour tastes of table salt and tartaric acid soon faded, umami was found to linger for several minutes. 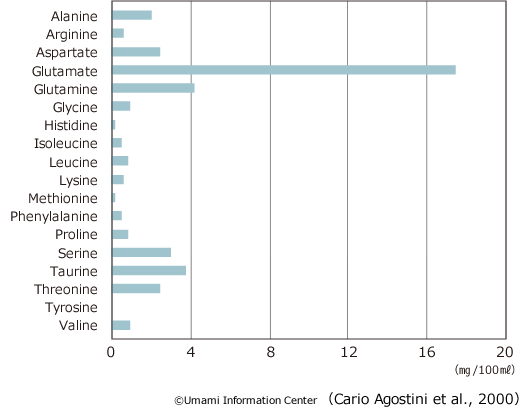 This suggests that even among the basic tastes, umami has a major impact on the aftertaste of foods. Sour or acid taste is widely known to promote salivation, but in fact it has been revealed that umami triggers the sustained secretion of saliva for a longer period. Furthermore, the saliva produced with sour tastes has a lighter quality, whereas the saliva produced with umami is more viscous, and this seems to moisten more the inside of the mouth. Without saliva we are unable to sense taste or swallow food smoothly. Umami holds the key to these functions. Synergistic effects which have been made use of for a long time. The main umami substances are glutamate, inosinate and guanylate, and it has been scientifically proven that umami is sensed far more strongly when these are present not individually, but when glutamate is combined with inosinate or guanylate. This is referred to as umami synergy. Yet people have been capitalizing on umami synergy for centuries, long before this effect was scientifically proven. All over the world, in dishes from soups combining glutamate-rich vegetables and inosinate-rich meat and fish, to the tang of Chinese cuisine extracted from chicken or pork bones and green onions, to Japanese dashi made from kombu (high in glutamate) and katsuobushi (high in inosinate), people have acquired an empirical understanding of umami synergy and applied that knowledge to cooking. 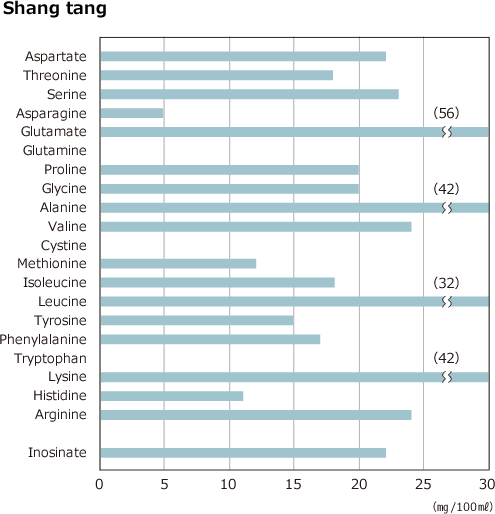 The strength of the umami synergy between glutamate and inosinate varies according to the ratios of each. When solutions containing slightly varying proportions of glutamate and inosinate were used to perform a sensory evaluation, umami was found to be most powerful with a glutamate to inosinate ratio of exactly 1:1. This proportion was deemed 7 to 8 times the intensity of tasting either glutamate or inosinate in isolation. 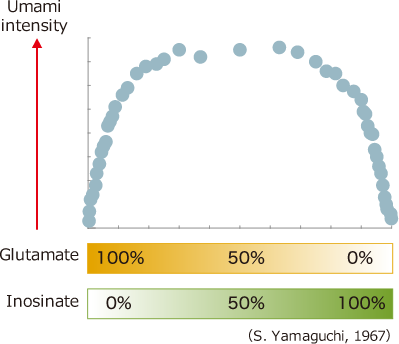 An analysis of the ichiban (primary) dashi used at one venerable Japanese restaurant revealed the glutamate/inosinate ratio to be exactly 1:1, suggesting that top restaurants know from experience the optimal proportions for greatest umami. ＊Proportions of glutamate and inosinate were adjusted to maintain a fixed total concentration (0.05g/100ml) of umami substance. The dashi of Japan, bouillon from France, Chinese tang?ingredients and uses may differ, but all are indispensable to their respective cuisines. Analysis of their content reveals all to be rich in the umami substances glutamate and inosinate, and all are striking in their intense taste. Both east and west make clever use of umami. Japanese dashi is simple, composed mainly of glutamate, inosinate, and the weaker umami substance aspartate. In contrast, bouillon and tang have high levels of amino acids that are not umami substances, and consequently have more complex tastes. ＊ Ichiban dashi is high in a weak sour amino acid by the name of histidine, found in katsuobushi. Analysis courtesy of : AJINOMOTO Co., Inc. The functions of umami are attracting growing interest not only in the world of cooking, but from medical and nutrition professionals as well. Umami also helps to reduce salt content in cooking. Numerous studies and statistics link excessive salt intake to many different lifestyle diseases. Yet food does require a certain amount of salt to taste good. Drastically reducing salt content renders food tasteless, and while we know that cutting down on salt is good for our bodies, a low-salt diet is difficult to maintain. It has been demonstrated that making use of umami allows salt content to be reduced without compromising palatability. In an experiment comparing egg-drop soup prepared according to a standard recipe with a soup made with extra umami, it was found that salt could be reduced in the umamiboosted soup by around 30 percent with no loss of palatability. In a similar manner, some Japanese restaurants are experimenting with serving healthy kaiseki food able to be savored equally by those on a salt-reduced diet, by focusing on boosting umami in food preparation. 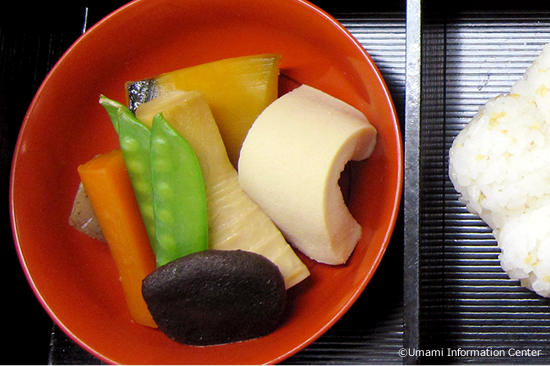 Incorporating umami skillfully into our daily diet allows us to enjoy tasty meals, even with less salt. Umami is mouthwatering, literally. Recent advances in taste physiology confirm that the umami substance glutamate promotes salivation. Salivation is further encouraged by the addition of inosinate. Taste impairment among older people is deemed primarily due to a decline in salivation, and with some reports suggesting that such impaired taste sense can be ameliorated using umami to promote salivation, moves are underway to use umami as a means of improving quality of life for the elderly. In the UK, for example, chefs and scientists are working together to develop umami-rich meals for this purpose. By reducing cream and butter content, boosting the boullion component and using umami-rich ingredients, this potage is made with only one-third the calories of a more conventional recipe. Enhancing umami allows more intense flavor with fewer calories. Kaiseki restaurants c can serve equally enjoyable low-calorie or salt-reduced diets, by using umami of dashi. One example is preparing simmered dishes with more umami-rich dashi. This can be achieved by increasing the quantities of dashi ingredients. Recent years have seen a growing shift in the developed world toward fewer calories and animal fats, as people look to prevent lifestyle diseases and maintain good health. As part of this dietary trend, Japanese cuisine has enjoyed burgeoning popularity, thanks to its health properties. Rather than relying on animal fats, Japanese cooking uses the umami of dashi to highlight the intrinsic flavors of ingredients, and chefs from all over the world have started visiting Japan to study these cooking techniques. Learning how to make Japanese dashi, they master the use of umami as an alternative to animal fats before going on to develop their own approaches to umami-oriented cooking. 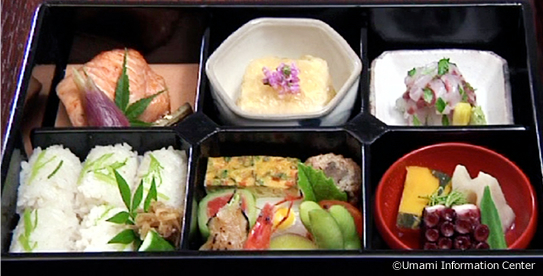 For instance, a kaiseki-style bento box made by one traditional Japanese restaurant uses over 40 different ingredients, yet contains fewer than 500 calories. The secret is the Japanese cooking technique of using the umami of dashi to enhance flavors. This kaiseki-style bento box uses over 40 ingredients, but contains fewer than 500 calories, by using the umami of dashi to highlight individual flavors.